Are you looking for a go kart for adults that is also environmentally friendly and quiet? Then, check out our list of the best electric go karts for adults that you can buy this year. Depending on your budget, you can get a kart that has all the bells and whistles or settle for a unit that is more basic but can still be used in family activities. Eager to bring back the childhood thrill of riding a kart? Invest in a good battery-powered go kart. It will last some time, is pollution free, and the fun is guaranteed. 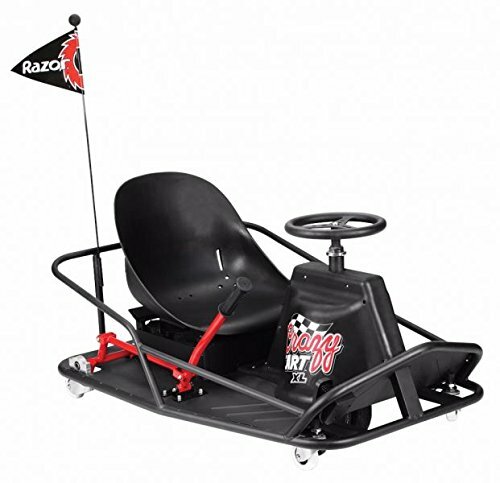 This Razor Crazy Cart (the 2014 edition) aka the ‘Ultimate Drifting Machine’ is an award-winning hybrid drift racer with a patented drift system, 4 spinning castor wheels, and two driving modes: Go Kart and ‘Crazy Cart’. If you plan to use the drifter as a go kart, we recommend driving it on flat and obstacle-free surfaces only. The cart is powered by an electric wheel placed under the steering wheel which allows the kart to turn 360 degrees in an instant. 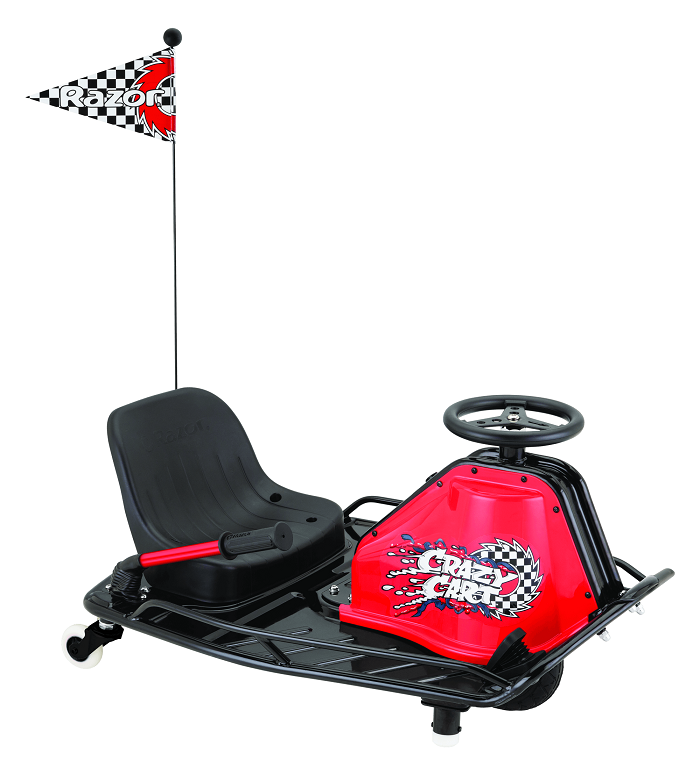 This ‘crazy’ kart has a drift bar that controls the rear caster angle which influences the direction of the drifts and spins. Although it can accommodate kids, this kart is not recommended for young children without parental supervision because it runs at full speed and spins are a lot more aggressive than in other Razor carts. The beauty of this electric go kart is that you can build it from scratch. 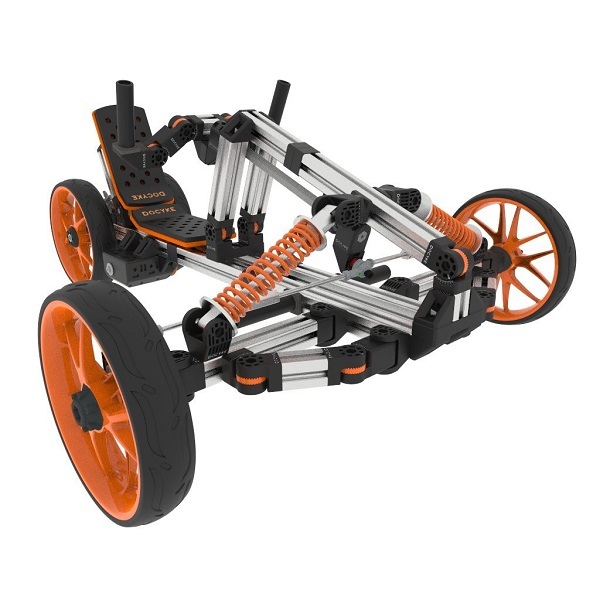 Just like a life-size Lego, this 10-in-1 racing kit contains modular parts to assemble into a battery-operated go kart, trike, scooter and more. DOCYKE has launched this product because they want to shift parents’ and kids’ mindset from consumers to makers. Another upside of this product is that it will help your kid develop a set of technical skills that can prove very handy later in life. The fully assembled go-kart can be rode by both you or your kid as it can be adjusted for up to 18MPH depending on gear ratio (the default speed being 5 mph) and can withstand loads of up to 330lbs (150kg). The Razor Crazy Cart XL is the larger version of the regular Crazy Cart already reviewed here. It can hit higher speeds (17 mph), has amore powerful battery (36 V), and it can hold up to loads of up to 240 lbs. It comes fully assembled and ready to go. The Crazy Cart XL is perfect for the kid in all of us. With an adjustable frame and speed lock feature, this sleek-looking electric go kart is fun for both parent and child. It literally makes no sound when riding and can sprint to 12 mph in just 2 seconds. The acceleration of this ‘mini-Tesla’ is the best in all other electric go karts that we have reviewed. One of the biggest advantages of this go kart is that it has a sturdy tubular frame that can be adjusted for the kart to fit 4’3’’-to-6’5’’-tall riders, which makes it an electric mini-racer suitable for all family members. Another big plus is the quality parts and fasteners and incredible finish. Not even one bit of this cart feels cheap or flimsy. The only downside is the price. 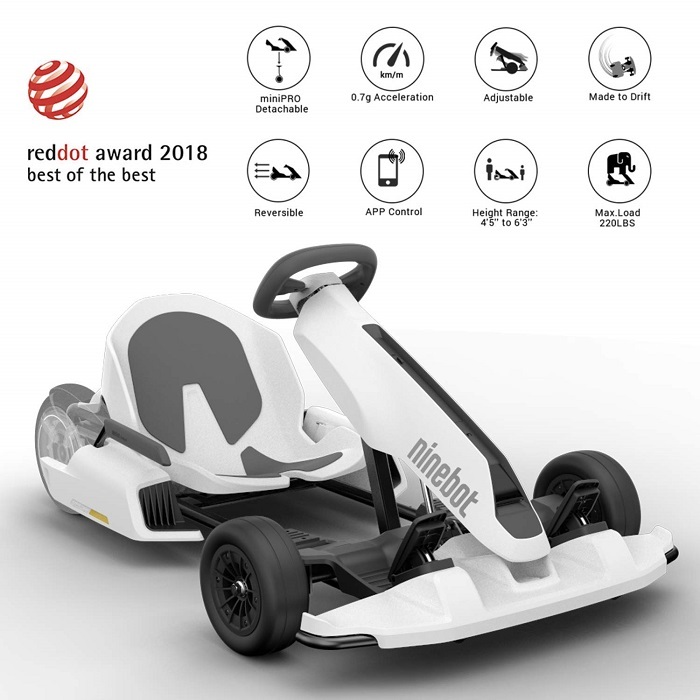 The Ninebot Electric Go Kart is pricey because this is only the frame kit and you’ll have to buy a Segway miniPro self-balancing scooter to have a motor. However, you’ll have a nasty go kart and heads-turning personal transportation device in one. The miniPro comes in two versions (the 320 and the 260). We recommend getting the miniPro 320 version because it has a bigger battery and better range. But if you plan to take the scooter on a commercial flight, get the 260 version. Electric go karts are quieter and more environmentally friendly than gas powered ones, as no toxic byproducts are released in the air while operating. Go karts with gas engine, on the other hand, are more powerful and louder than electric ones. So, if you’d rather sacrifice speed for a pollution-free alternative, go for an electric go kart. But when looking for an electric go kart, pay attention to its maximum load capacity as everything that goes beyond that may burn out the motor or drain the battery real fast. Also, go karts that sit very low on the ground should not be driven in the street, regardless if you are an adult. Even though these carts might sport a flag, they are very hard for cars and trucks to spot. Use them on driveways, sidewalks, in parks only. What’s more, if the battery is not embedded, we recommend buying an extra battery, as with most electric go karts charging time can last up to 12 hours. It is always nice to have a fully charged spare battery on hand when the primary one dies. However, if the battery is embedded you cannot swap it for another one for the extra ride, unless you want to void your warranty. We hope our selection of the best electric go karts for adults has offered you a place to start. We do recommend electric karts as they emit no polluters, are very quiet (some of them completely silent, like the Ninebot), and the battery is very easy to recharge. Our personal favorite is Segway’s Ninebot for the premium design and sturdy construction. What’s your favorite? Leave any thoughts in the comments below.